I saw the Grand Canyon yesterday, and none of my children fell over the edge, which is a good measure of a successful day at the Canyon, I’d say. The real measure of a day at the Canyon, in which I try to put into words what I saw–well, that eludes me. For centuries, people have tried to capture that spectacle in words, photos or paintings, and for centures, they have fallen short. I’m not sure I’m qualified even to try. We stayed long enough to watch sunset, a spectacle we’d been told we didn’t want to miss. Though the crowds had thinned through the late afternoon, a large gathering had assembled at the recommended lookout. Several brave souls sat right at the edge, their hiking shoes dangling over the precipice. There was a rumble of friendly conversation all around us, much of it in French, Japanese, Spanish and German. The sun began its final disappearing act, lowering to touch the western edge of the canyon. The conversation around us slowly quieted. We all watched the vanishing sun, vaguely recalling our mothers’ warnings that we’d burn our eyes, but how could we look away? “Down, down, down,” my daughter whispered. There was just a sliver left. And then it was gone. The dusty, sunburned, multi-lingual crowd spontaneously erupted into applause, the sound of our claps disappearing instantly into the depths around us. It was such a small thing to do, to clap for the sun and the Canyon, two giant forces so much bigger than any of us, and entirely out of our control. But we did it anyway. I guess there’s just something in us that needs to say thank you. Sometimes we all need to stop and look, really look at something, in order to appreciate its beauty. I think your description was perfect. I may not have seen what you’ve seen but I believe I just felt what you felt. You were in my state! 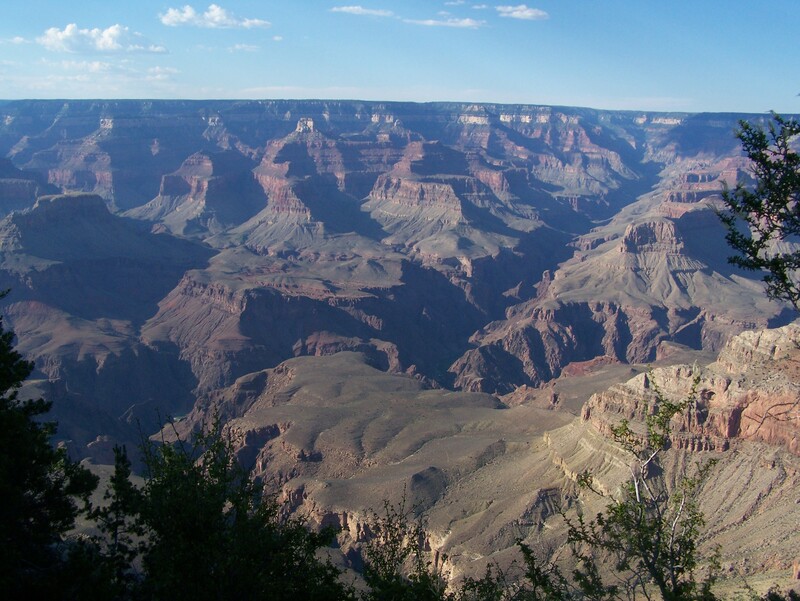 I’ve been to the Grand Canyon only once, and even the most beautiful of photographs never do it’s majesty justice. How wonderful that people clapped! That made my eyes well up with tears. Oh, that we would stop every day and notice the miracles, big and small, that God performs just for us and applaud Him. I think that statement qualifies for your sunset at the Grand Canyon. I felt like that too, when I was over there. We watched the sun rise over the Canyon, that was very impressive as well! This was beautiful — the post, I mean. The pictures too, but your writing had me captivated. I have never seen the Grand Canyon but I hope to some day. Sounds like you are having a lovely trip! What an awesome experience for you and your family! Seeing the Grand Canyon is definitely on my Bucket List. Beautiful post, beautiful sunsets. God is so good! Such a beautiful post. I enjoyed watching the sunset through your pictures!! One day I would love to see the Grand Canyon. I’m glad you all are having a wonderful vacation. The irony of me getting all teary-eyed at the nature is not lost on me – but this post made me weepy. So beautiful. Hope y’all are having a ball! If words could express it, you just did. Thanks for sharing!!!! It was BEAUTIFUL!!! What a beautiful post! Sounds like an amazing experience. Beautiful pictures! Thanks for sharing your vacation with us!! So very beautiful! Thanks for sharing for those of use who have not been there. It really is awe-inspiring and a bit surreal. BTW, I wish I had known you were going there. Did you go via Flagstaff? If so,I could have told you of a darling little chapel on the side of Highway 180 called Chapel of the Holy Dove. It’s where my husband and I got married. oops… Hwy 151, I think. Beautiful day!! Life is so good, when you know the artist of such wonders personally…mmm. Beautifully written! Oh, I am so jealous. There are so many things I wanted to show my children, but now they are almost grown and there is no time or money left to do it. My life is measured by the number of summers that are left before they leave home, and I’m starting to learn how to deal with the feeling of failing my children. Yours are very blessed! Wow, what a beautiful post. And what a meaningful family memory you’ve made and captured perfectly here with your words. Beautiful pictures, beautifully written, beautiful place. Wish I was with you! Amazing pictures. I have never been so thanks for sharing. Love it! Thanks for the great pictures and commentary. I feel like I just got to go! Great pictures. That is one place I will NEVER visit. Heights and me are not a good combination at all. My father tells laughingly about the time he and mother went to the Grand Canyon because she just had to do it but she was scared. He and I have the height issue in common, he is worse, but he got Momma there. He said that she got out of the car and then crawled up to the edge area and took pictures while the Japanese tourists pointed and laughed and took pictures of her on her belly. She crawled back to the car and they were off. I guess she had her height issues too but didn’t want to let an opportunity pass. I’m getting that way too, so you never know, I might visit someday. My dad lives and works right there. I get pictures like that a few times a week. Also, he has never been that close to the edge. I think he’s seen one too many go down. What a sweet story of both the wonder of God’s creation and the way it unites strangers in community. Wow, that was so well written! I almost cried a little! The heavens declare the glory of God, and the firmament showeth his handiwork. Indeed! Beautiful for sure. But…I am far too terrified of heights to visit there (just had this conversation this very weekend with hubby). My stomach actually got knots and queasy just by looking at the pictures. I kept imagining if one of those you said dangled their feet …well, you know. Sorry, I must enjoy this Mastery by the Master only through pics (preferably not of the edge). 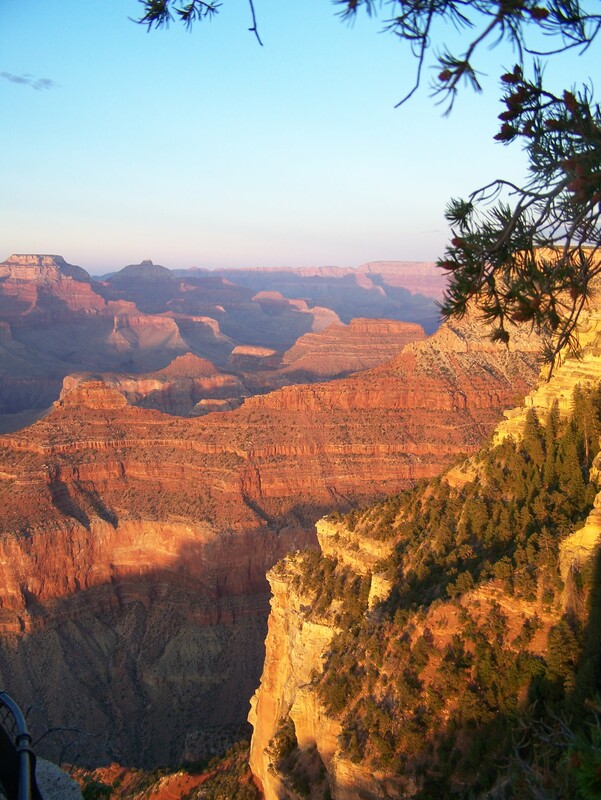 The Grand Canyon just moved from number two to number one on my bucket list…nice post. It is an amazing place to visit. Your daughter’s thought about the Disney Princess’ made me think of my then 5 y/o niece’s comment. She looked out and said “WOW ! That’s a big hole what’s next?” We all cracked up and still use that phrase today when we something of majecitc awe. Thank you for posting this. Breathtaking. 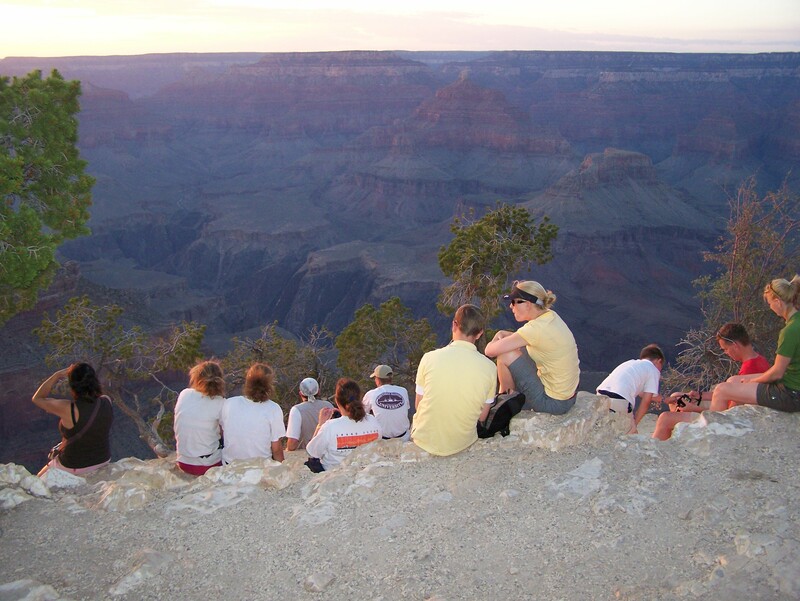 I’ve never been to the Grand Canyon, and I think I may get a little pensive sitting on the edge too (lol), but I do want to take our kids some day. Beautiful! And congratulations on the book you are writing! I’ve never been, but I hope to get there someday. One of my ancestors is John Wesley Powell. The first man to explore the Colorado River. Lake Powell is named for him. And he only had ONE ARM! I did a report on him in elementary school and was able to show two blankets that he had traded with the Indians. 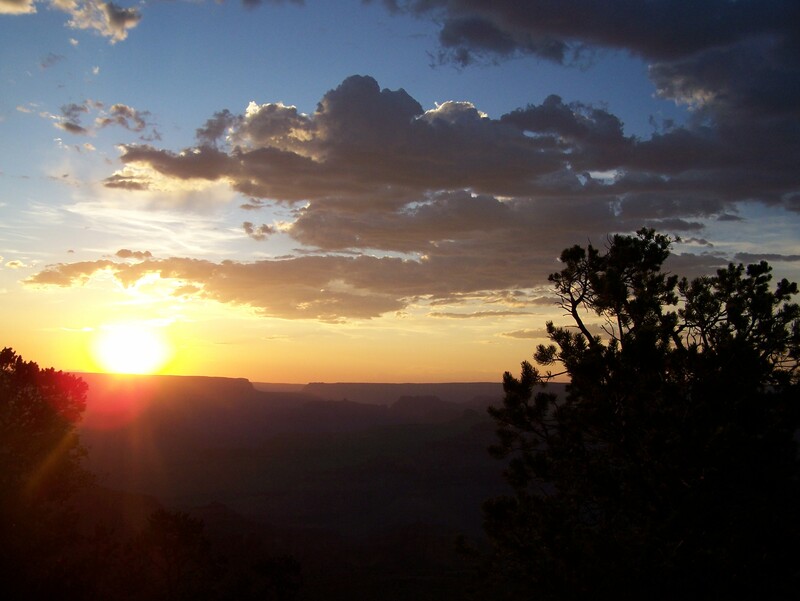 I’d love to see the canyon sunset someday. Thanks for the beautiful description. The thought of a group of strangers clapping for the sunset at the Grand Canyon just made me cry a little. Beautiful and strange – but mostly beautiful. “Down, down, down.” I love that! It’s a gift to be able to give thanks. Thanks for sharing your gift with us. Oh, we did the Grand Canyon thing when I was 16 and my youngest sister was 2. We were like you – we considered it a success that we left with the same number of people we arrived with, whether they were the same people or not! It was amazing. The vastness of it all is so hard to comprehend, even when you’re standing there. It just takes your breath away, and other than that, it’s impossible to describe. I’m glad your kids enjoyed it. They’ll remember it forever. i have only gotten to fly over the grand canyon and look at my sister’s pictures when they stopped on the way to california. i totally stole your second picture for my desktop background! The Grand Canyon IS amazing, isn’t it? Pictures just don’t do it justice. It’s really very awe-inspiring. Oh my I was nervous just looking at the picture of the people sitting on the edge. I think I need to read another post to settle my heartbeat. That’s absolutely beautiful though. If we ever drive to California I want to stop there…but I’ll stay away from the edge. You know, I’ve been to the Grand Canyon countless times, and it never fails to amaze me. Thank you for your tribute. Amazing! Hubby has been there and wants to take me one day. The pictures are breathtaking, I can’t even imagine what it’s like in real life. I visited the Grand Canyon earlier this year and experienced similar word-defying sentiments. And like you, I felt the need to record the experience — I called my post “Holy Ground”. I’ll not forget my visit there anytime soon. (Perhaps never, but really, who can say?) But as I groped for words to find hints of truth, I saw that the Grand Canyon was just one of God’s huge sacred souvenirs, pointing us toward the edge of eternity. Glad you and yours are enjoying your summer vacation, creating a few lovely memories for later.